posted on Aug. 15, 2018, at 7:00 a.m.
Today’s kitchen serves way more than just delicious meals. It has evolved into a space for entertaining, checking email, doing homework, paying bills, and so much more. So, its décor has to reflect its multifunctional duties as well as the myriad of design options in the marketplace and connection to adjacent rooms in open floorplans. According to Pierce, 59% of kitchen updates are changed to be more open and to include other rooms. And, 49% of kitchen updates increased the footprint of the kitchen. Consumers are looking to entertain more in their kitchens, and there’s also a push to create more nutritional meals, since it’s become easier to obtain fresh ingredients. Technology in the kitchen also dominates homeowner needs — and as much as they want places for their devices, they’re always looking for solutions to de-clutter their tech. Pierce’s webinar was part of NKBA’s free monthly webinar series. Each month, the Association offers one-hour webinars on a themed topic. For more information and to register for the webinars, click here. Pierce said 23% of consumers say their biggest mistake is penny-pinching on cabinets, lighting and organization. Homeowners want wide drawers, base trash, pull-outs/roll trays, pantries, cutlery space, and corners. They also want better drawer organization, enhanced access for hard-to-reach areas, and increased functionality. The average home is around 2,000 square feet, but small home renovations and construction still occur frequently. Clients are looking to retain antique charm while mixing in clean lines and simple styling for their smaller home projects. Modern cottage pairs whites, off-whites, and light-toned paints with colors and slight embellishments. Clients often prefer simple and clean styling over ornate details. This is because minimalist style appears to cater more to a busier lifestyle. This style is sometimes described as modern or contemporary. Doors, glass, and tile are utilizing the X motif due to its flexibility as an accent. It serves the refined farmhouse style or as a natural graphic element. It is reflected simply as an “X” in the middle of the design. For clients who seek clean-looking cabinetry, tailored shiplap caters to that design sensibility. It carries the eye through the space with its texture. Tailored shiplap offers clean lines, and it can also be mimicked with planking. This is achieved by using finishes with multi-tonal characteristics — for example, the luster of metals combine with organic elements in the kitchen. Dimensional finishes offer clean lines, movement and texture. According to Pierce, 49% of designers saw the mix of an opaque and a stain trending up in 2018. 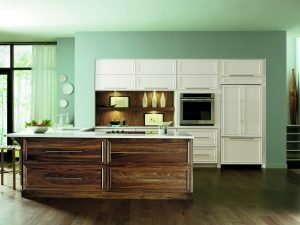 This trend has the most potential in cabinetry, since it has more flexibility than other products. It also allows design flexibility, because it offers more choices should homeowners choose to change anything in the future. Defined or rustic woods are made from woods such as walnut, oak, cherry, ash and elm. Their standout feature is heavy graining. Defined wood grain texture allows for depth, and usually are defined by desert and winter forest tones. This trend can be enhanced with cerusing and wire brushing. It offers various texture without the need for a lot of color. This trend celebrates imperfections. It calls for an organic palette that complements colors such as opaque tones including white, off-whites and khakis. Defining characteristics are pale woods with dry finishes, and the raw look is trending up. White is still a primary choice for finishes, but it is becoming “dirtier” and khaki-toned. Dark tones are added to create a balance with the whites included in kitchen design, and it creates a strong silhouette. This trend is achieved by utilizing walnut or deep finishes on cherry and oak. This trend involves wood stains that appears to change based on wood species, lighting in the room, and what’s placed next to an item with the stain. Chameleon colors offer a balance between warm and cool tones. Neutrals still serve as the baseline for kitchen design, but personalized color is making a comeback. People are looking to express themselves in their spaces by way of color choice. There is an increase in the use of laminates in kitchens, and because of increased technology, a lot of them offer more realism and texture in their appearances. For example, some laminates boast an authentic wood look. According to research by The Fredonia Group, increased cabinets and furniture demand will continue to drive the growth of decorative laminates in the United States 2.5% annually.